I very well remember my mother singing this song on Sri Raghavendra Swamy after finishing all the pooje, and just before singing “Thugire Rayara” song. Today being Thursday, I decided to post this song here as well. This song is composed by Sri Jaganatha Vittala Dasaru. Attached is the lyrics in Kannada and English. P.S: To know the exact dates of events happening in your city, take a look at the following link provided by Ms. Shalini Rao. More details about Vaikunta Ekadashi can be found here. It has been a long time since I posted anything here. It has become crazy busy at work, and I really didn’t have anytime to update the blog. Thanks for all those who kept emailing me about my whereabouts. Appreciate it so much. 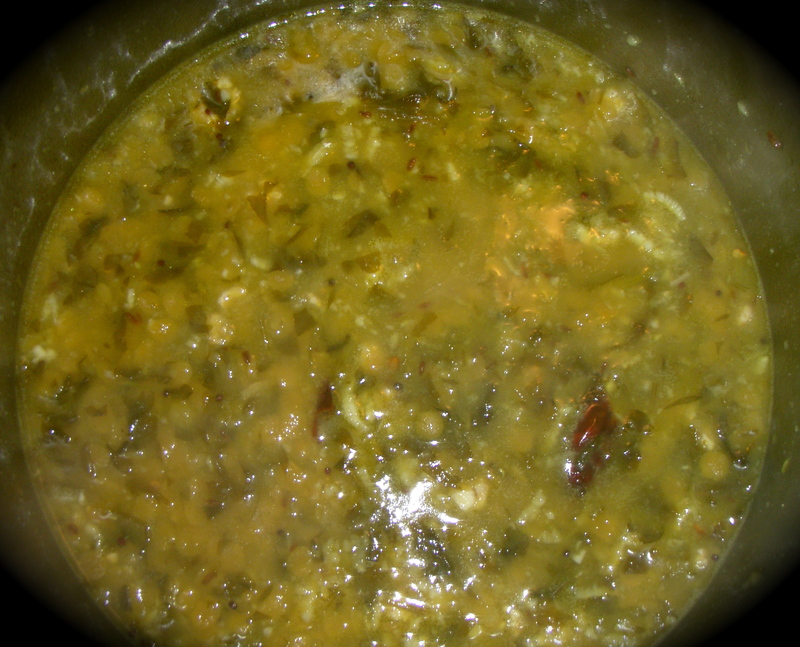 So, here comes my favorite dal, my Mom used to make and I prepare almost regularly. Every time I visit the Indian Store, I get a bunch of Methi leaves. It costs less than $2. And I usually prepare either this Dal or Methi paratha, or Aloo Methi. 1 bunch Methi Leaves, washed and finely chopped. For seasoning : Mustard seeds, Hing, Turmeric, Jeera, Red Chillies, curry leaves. Wash and finely chop the Methi leaves. In a pan, heat oil and add all the ingredients listed in seasoning. Add the cooked dal, salt to taste, coconut, jaggery and let it boil for a few minutes. P.S: If you want to serve with chapathi, and less water while cooking the dal.